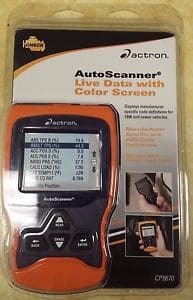 The Actron CP9670 scanner is a handheld device that is compatible with many ODB 2 cars that have been made in between the years of 1996 to 2013. It comes in a modern appearance with an orange shell and a dark grey face. The look of the scanner may be unusual at first, but you will be sure to enjoy using it by looking at its large screen and feeling how comfortable it is to hold. The scanner itself only weight 1.3 pounds. The color LCD screen is large and clear enough to be seen from a few feet away. This way, you can hold it without ever having to hunch over and lift the scanner close to your face, and you can still see information clearly with not need to get out of your comfort zone. The bottom half of the scanner is slimmer and is designed to fit comfortably in either your left or right hand. No need to go through difficulties gripping a larger, bulkier piece of equipment, as you’ll be able to hold this scanner fine with just a few fingertips alone. There are four buttons to use to navigate through menus: Read, erase, enter and back. “Read” and “erase” also act as up and down arrow for scrolling through options in menus, while “enter” is used to confirm and option and “back” is for returning to a previous menu. There is no bundle that the Actron CP9670 comes a part of. What you get for buying the CP9670 is the scanner itself, a cord that connects the scanner to your car and a limited warranty. You connect the scanner with this cable to a port that is underneath the dashboard on the driver’s side. ABS codes can be read, reviewed and deleted in many different cars from popular manufacturers. These manufacturers include Ford, Honda, Toyota, Chevy, Chrysler and much more. The scanner has all the DTC codes in its system, but it can automatically save a made and model of a car to a preset once you have it registered with the scanner itself. 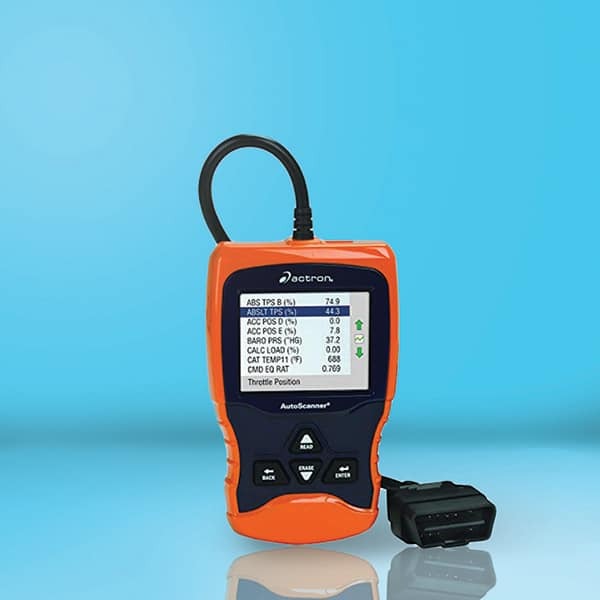 The CP9670 scanner can easily remember what cars it has previously connected to. The freeze frame allows you to record and playback live engine data, so that you can see new developments with your car as they happen, in addition to rolling back time to when past problems originated. This is very handy for when you know there’s a problem with your car, but you don’t know when or how it happened. The device overall is a beaut to look at, and it feels like a piece of equipment that you’d rather own to help you with your car diagnostics tasks. We have yet to experience any problems with how the scanner overall was designed, and it is far from feeling like a big, bulk brick in your hand. The screen is big, bright and clear, and the fact that it displays information in color is enough to win any car owner and specialist over. Even though the buttons seem like they are pretty straightforward, it can be rather a challenge to get to the option that you need to go in. For example, if you want to delete a code in a list of other codes, the logical thing to do would be to press “erase”. However, that just scrolls the selection down the list, as the button is also used to scroll down. The same with the “read” button, which has the up arrow on it. While there is a limited warranty that Actron offers, it will not be good for replacement parts that you want to replace, such as the screen if it ever goes bad. When something, anything on the scanner breaks, you will need to buy a new one. The last disappointment we have is that it will not work on cars made in 2014 or later, so we only consider this to be for you if you own or work on cars that were made in 2013 or earlier. Unfortunately, it is not able to receive updates for newer cars and newer car definitions, which is disappointing if you were looking forward to using this product for a newer vehicle. Considering that this product was made in 2015 is considered to be inexcusable. The Actron CP9670 is a very decent device for not including any other equipment along with it. If not for complications in button mapping, navigation and the fact that it doesn’t support newer vehicles, we would put this near the top of the list of the best OBD 2 diagnostic tools.